A Great Value Doesn’t Last Long! 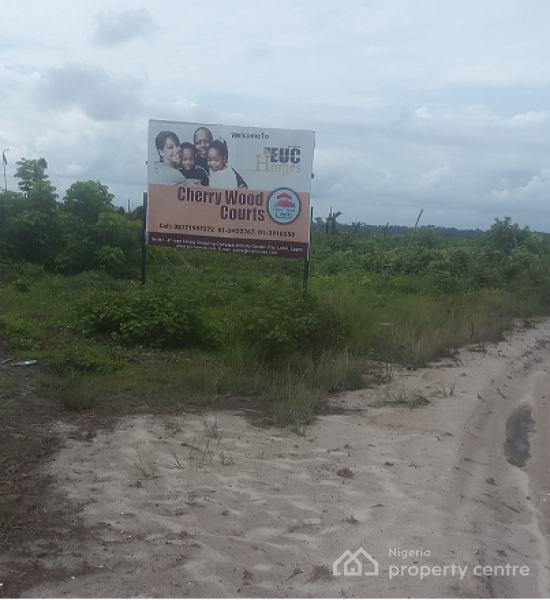 Do you Desire to Own an Investment Like this in a location perfectly position 7 minutes drives from the Lekki Free Trade Zone in Ibeju Lekki? This Masterpiece is Over-looking the Lagoon and gives you a feel like you’re in a Mediterranean resort and Ideally positioned for Investors who want to acquire lands & use for the purpose of hotels, restaurants or relaxation resorts. Many desire for comfort, but only few realise where real comfort lies. Real comfort lies in CHERRYWOOD COURTS. This attractive and alluring estate is highly seated on a parcel of land of over 60 acres in Osoroko town along the Lekki Free Trade Zone road, Ibeji Lekki. The estate is presently on high demand from people all over the country and beyond. If your desire is to have a safe haven, a place of peace and tranquillity and a place where you can call a real home and investment, then CHERRYWOOD COURTS is just for you! CHERRYWOOD COURTS is just 1 mile from Dangote refinery, gloriously covered with a global C of O and free from any form of encumbrance. We offer a plot size of 60ft by 120ft in this estate and allocation is instant. 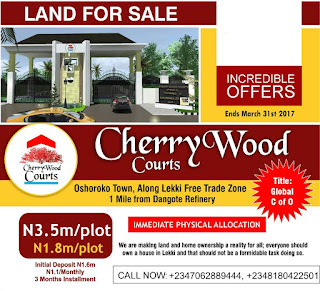 Cherry Wood Courts is presently selling for N5m per plot while half plot sells for N2.5m. CHERRY WOOD COURTS….Just another paradise!